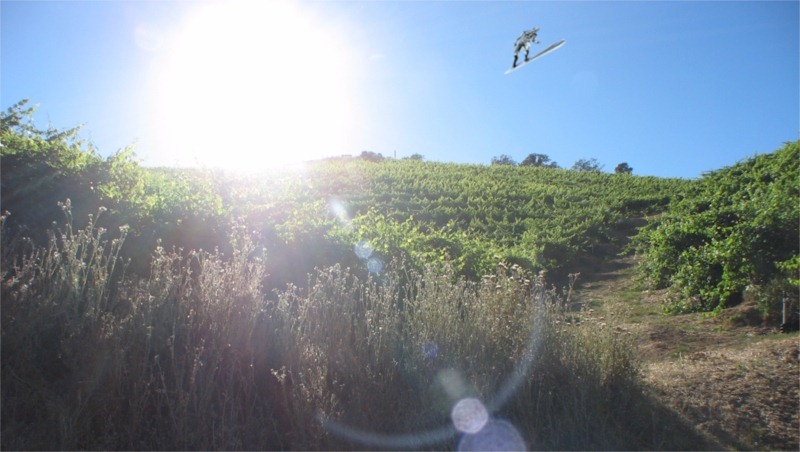 Silver Surfer Sighted near Napa! 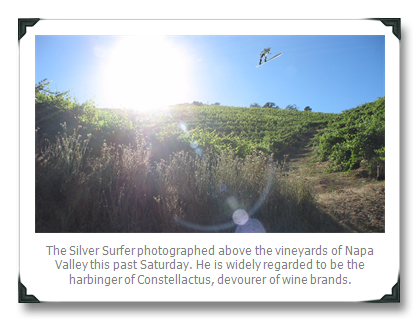 Constellactus (“Devourer of Wine Brands”) Approaches Earth! Special Report from the IP (Inebriated Press) – Constellactus, devourer of wine brands, appears to be heading towards Earth, with dire consequences for the planet’s wine industries. Fueled by the mysterious “power cosmic” and a recent rise in market share, Constellactus Brands – devourer of wine brands and the largest wine producer in the known Universe – is expected to reach Earth in a matter of days, say world scientist and wine industry analysts. Constellactus is widely feared throughout the known Universe for its seemingly insatiable ability to devour a planet’s entire population of wine brands, in some cases leaving the Profit and Loss statements of those brands a mere husk of their former selves and laying waste to their market positions. I have uncovered potentially serious evidence that could possibly refute the recent scientific evidence suggesting that drinking wine makes you smarter. 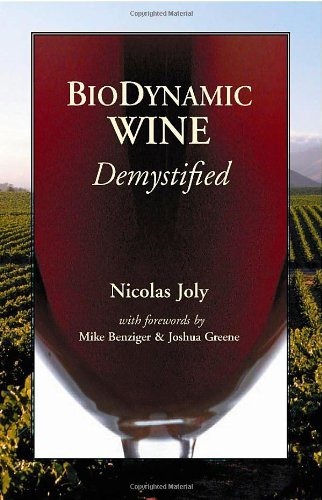 Specifically, I offer my recent experience reading Nicholas Joly’s essay-like treatise on the hot-potato topic of Biodynamic viticulture, Biodynamic Wine, Demystified. If this is the demystified version, I’d hate to see it mystified. 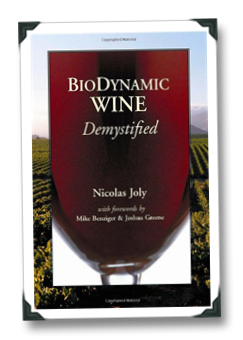 I received Biodynamic Wine, Demystified as a gift, of sorts, from the lovely (I know it doesn’t sound particularly manly, but he is a lovely guy) Mike Benziger after a recent visit to his family’s gorgeous biodynamically-farmed Sonoma wine estate. Frequent 1WineDude.com readers will recall that some of Mike’s comments in my video interview with him caused a bit of a stir and sparked lively comments-section discussion on the topic of soil profiles and biodynamics generally. 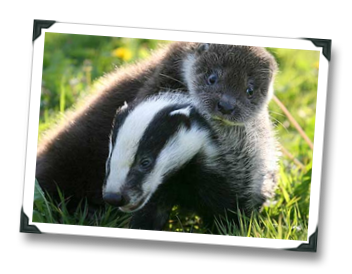 Those discussions mirrored, in a way, the current love/hate tête-à-tête – ok, and the occasional heated exchange of invective barbs – between biodynamics’ supporters and detractors. Sorry – couldn’t resist. 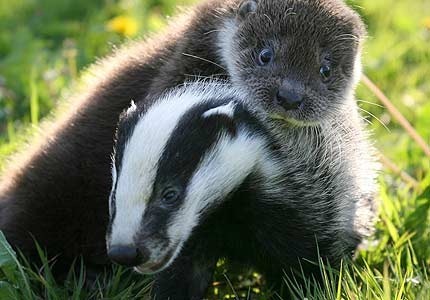 I mean, just look at those cute, furry-cuddly, viciously-fanged mammals over there! I mean “other badges” of wine reviews, of course – in my case, I’m the late-comer to the wine badge review par-tay masterminded by Vintank; that is, late-comer in terms of getting my badges ready for prime-time (I was part of the “wine badgers” group from the conceptual phase). It might help to think of the badges as a cross between a score and a medal, but with more awesome. The cool thing is that the badges are already in use by Mark deVere, Ward Kadel and Steve Paulo. The badges aren’t yet standardized, which I personally think might come back to bite us in the tushie somehow, but in terms of distribution these puppies are primed for success. HelloVino, Cruvee.com, and Yourwineyourway.com are already signed-on and using the badges, which thanks to their distro. system are automatically being included in content like winery Facebook pages. 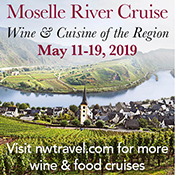 We often talk about on-line technology having the potential to change things in terms of the wine world – this is an example where the potential is starting to actually be realized. The main criterion for a wine receiving a 1WD badge is that I give it a “grade” in the B or A range; after that, if I think that they meet the criteria for a particular badge then tat wine will be “awarded” one.